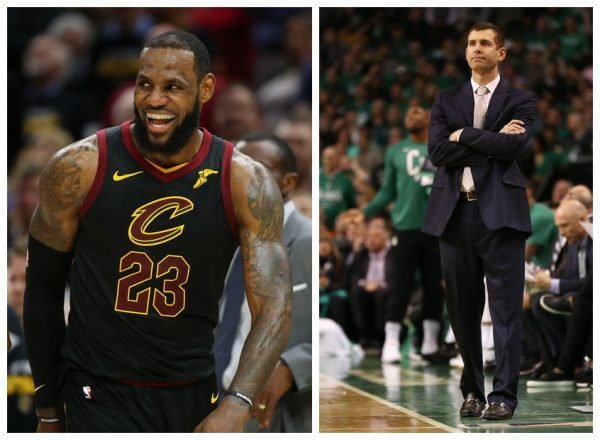 While in the Western Conference we’re seeing two series that might go a bit further than initially expected, things are quite different in the East: Both the Cleveland Cavaliers and Boston Celtics are making their way towards surprising sweeps. Yes, it’s surprising that LeBron James and co. are sweeping the Toronto Raptors, despite their 4-0 win against them a year ago in the conference semifinals. The Cavs don’t have home court advantage, struggled towards the finish line in the regular season and needed 7 games to dispatch of Indiana, with James getting very little consistent help from this teammates. But here we are. The Cavaliers are leading 3-0. It hasn’t been a breeze. An overtime win in game 1 and a buzzer beater (sorta) by James in game 3. In between was an 18-point win in game 2, with Kevin Love regaining his lost form following a poor start to the playoffs. The Raptors have been building towards finally ousting James from his perch in the Eastern conference. Being unable to do it one more time despite the circumstances favoring them significantly compared to the past puts the future of the team as it is in a negative light, although it feels like we were in the same position, with the same questions and doubts a year ago exactly. In the other Eastern series, the Boston Celtics, the injured Boston Celtics, are leading the young, enthusiastic and trendy (not so much anymore) Philadelphia 76ers 3-0. The star this time is Jayson Tatum, a rookie, outshining Ben Simmons, who got every compliment possible after the Sixers kicked the Miami Heat out of the postseason. Tatum is averaging 24.3 points in the series, but he’s not alone. Terry Rozier is lighting things up with 22.3 points, letting the Eric Bledsoe beef momentum carry into this series as well. Al Horford is playing incredible basketball on both ends of the floor, providing the veteran leadership many thought this team was missing. And there’s Brad Stevens, probably getting more praise than anyone. He’s had to deal with injuries, most recently with Jaylen Brown missing one game, and now back, doing his thing off the bench. Stevens, despite the boy-genius label, had criticisms directed at him for the Celtics results in the previous postseason he coached from the sidelines, including last season when they reached the conference finals. This year, without Gordon Hayward and Kyrie Irving to help out, there’s no one to doubt the kind of job Stevens has done in shaping this team into a well honed, disciplined and intelligent group that epitomizes the plug-and-play concept, at least until they run into LeBron.